Push Your Luck Podcast: Longer, Bigger... Haha, oops.. Istanbul! Helios! Macao! Homesteaders! 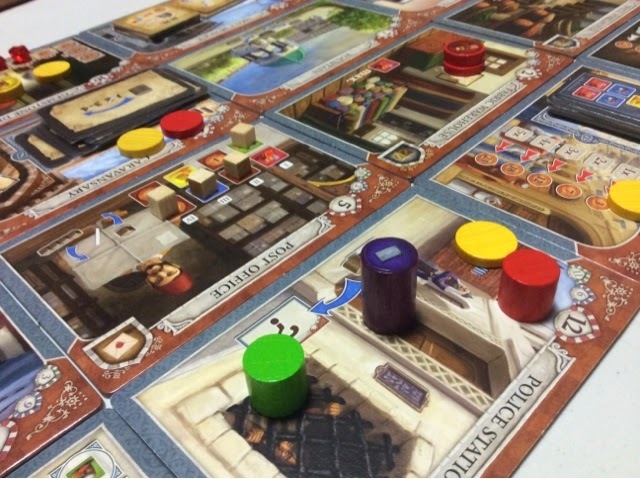 Istanbul is an action selection management game whereby players are moving their limited pieces around the board to execute actions. A player may only execute the action of the tile he/she lands on if he/she was able to either leave a worker there, or if the player already has a worker there and is going to pick it up. 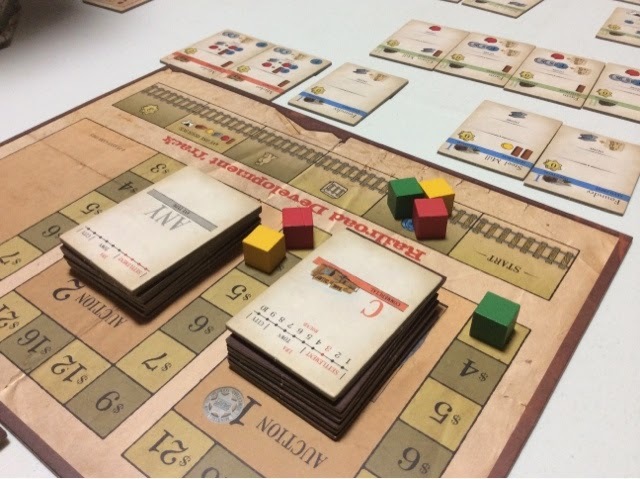 So the game is all about balancing your actions by ensuring that your workers are strategically placed on areas that benefit you through multiple trips or that your workers are placed on action spaces that can lead you on to other important spaces without having to waste turns in between. 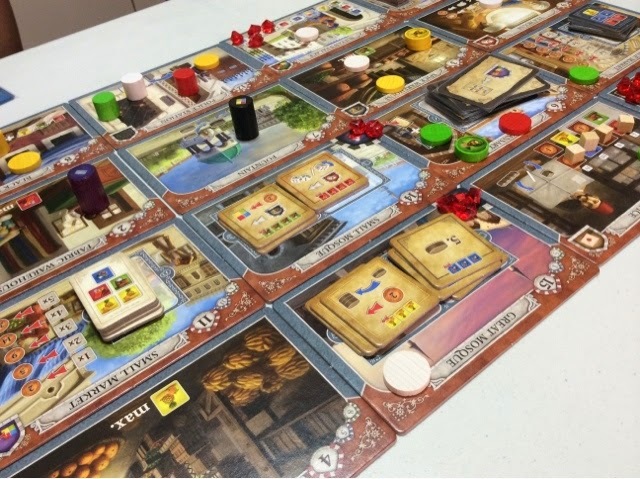 The board in Istanbul is made up of 16 tiles which may be randomly distributed - this ensures that each game feels different in terms of which strategy you may choose to pursue. If say the tile that allows you to buy a gem and the tile that allows you to gamble for money are far apart, then it may not be such a good strategy to rely on for that particular game. I'm almost there! Attempting to win by buying gems and not relying on the goods cart. Oh I nearly forgot, the aim of Istanbul is to be the player with the most gems by the end of the game. Each player has a cart to hold gems and when someone reaches 5 gems, that is the last round of the game and the game is over when everyone has had an equal number of turns. At the end of the game, the player with the most gems is the winner, ties are broken by having the most money. Before I had the chance to play Istanbul, all I knew about it was through the videos I watched and reading the rules for research for our SDJ and KDJ podcast episode. The impression I got out of it was good as it gave me the feeling that it was a meaty game with nice decision choices, yet it would probably play in a relatively quick time. I had concerns about replayability as it seemed like you will always be doing the same things each game ( gain money or goods, trade in for gems ). Well, after my first and second plays of it, I will say that everything I thought about the game before playing is exactly what I think of the game after playing it. I'm green, on one of my favorite spots - the Tea House. Claim a number and try to roll higher than that to get money. Istanbul was fun. So fun that we had to play it twice. And it was the only game we played twice that day. That speaks volumes for the game as we seldom play a game twice in the same gaming session. I had tough choices to make during the game as there were spots you wanted to be at before others so that you won't have to pay the player an additional 2 dollars for being where you wanted to go to. 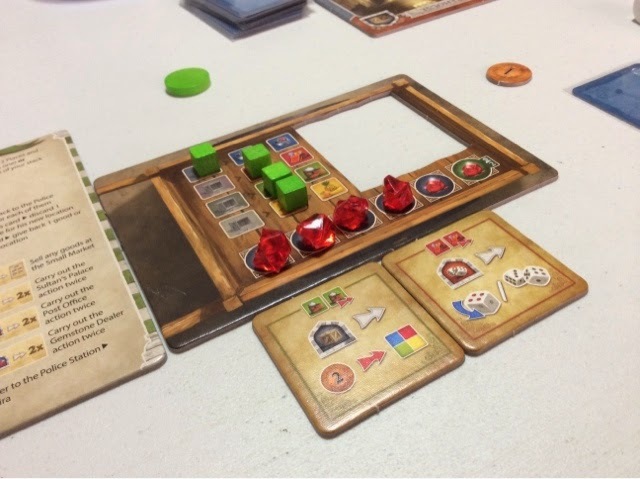 Yet, you also wanted to ensure a good line of communication between each of your workers so that you don't have to waste a turn to travel to the fountain to pull all of them back, or to go back and slowly pick them up without benefiting from the tile action that they are sitting on. It fell under the meaty yet enjoyable spot for me and not the meaty and tiresome spot that some games fall into. I also loved the race within the race of the game. The main mechanic of the game is a race - to 5 gems. But within this race were multiple smaller races. Race to a tile, race to convert resources to gems, and race to sell/obtain resources at a more favorable rate. 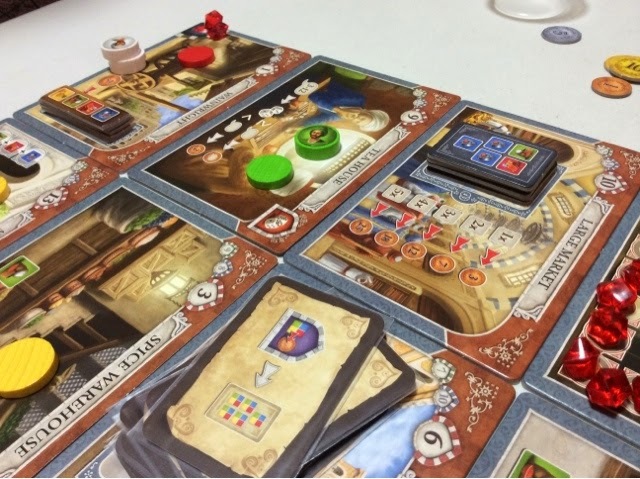 Everything in Istanbul felt like a race because every tile had an earlier there cheaper cost mechanic. If you bought gems early, you paid less, if you trade goods for gems early, you traded less. If you went to a market late, the new market tile may not indicate the goods you are able to sell. So everything felt like rush rush rush, and that itself was pretty entertaining. But coming back to the replayability of the game, well, that's where I feel a bit sad as I'm not sure if Istanbul is a game that can be played multiple times in a season. Sure, the tiles are randomly placed, so that makes for a different layout each game, but that does not change what you are doing at the heart of the game. You go around, pick up stuff, send those stuff for what you really want. Whoever does this fastest/best will win the game. There's nothing wrong with that as other games feel the same way too, but somehow I think Istanbul may suffer more than these other games as it just does not have sufficient variety in the choices of the actions available. The 16 tiles are fixed, none can be removed, no additional may be added. So you see the same tiles game after game, the only question is where each tile is located in relation to other tiles that combo with it. Also, although there are 16 tiles, they all boil down to the same thing - get money, get goods, sell goods, obtain gems. That's it. There are special ability tiles and order cards that let you bend the rules of the game, but not all that significantly. Although this may sound like I am hating on the game, I am not. Its just that I feel strongly about the lack of replay value in Istanbul after say a dozen or so games. So good we had to play it twice. 2nd game. Goods strategy left me one turn too short to claim 5 gems. 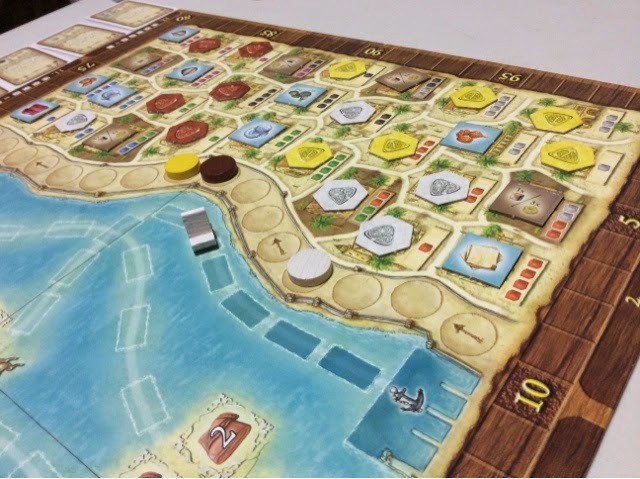 So, do I still stand with my prediction that Istanbul will win the Kennerspiel Des Jahres? It's fun, it's meaty, yet it's still accessible to the majority of people that may not have played a game before. But wait, doesn't that mean that it does not fall under the Kennerspiel nominee specs that says it's a gamer's game? Well, based on the past winners - 7 Wonders, Village, Legends of Andor - I think they are all rather to the lighter side as well. So Istanbul won't stick out like a sore thumb in their company. 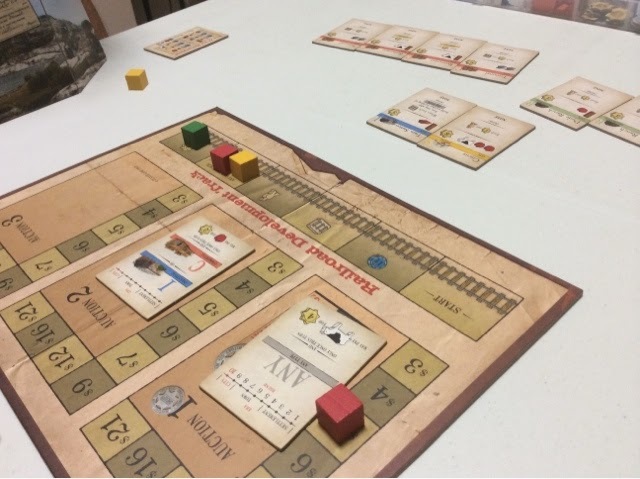 Eric and another friend had played it before and Eric mentioned that it reminded him of Russian Railroads - which is a good thing right! Cos RR is indeed a most excellent game. Well, let's take it step by step. Helios is hideous looking, for real. Look at it. The colors are bland and barely there if you ask me. The iconography is ok, you will be able to figure it out after some time, but everything is so congested looking on the building board that really, even for a seasoned gamer like me it scares me. I look at it and I know I am in for a tough time trying to decipher everything early so that I can be competitive.The early impression wasn't very good. I disliked the look, the layout, the box, everything. Honestly I nearly lost interest right from the start. It was that bad. Well, but of course I stuck to it. Played it out and came in second. So how was it? Well, it was merely ok. I will say it was a very quick playing game though. So that is always a good thing. For the time spent I felt that I made very tight and difficult decisions through the course of the game. I ain't going to describe the game in detail as honestly it's rather difficult without having the pieces to move and explain because a lot of things happen with that yellow disc called the sun and without moving it it is hard to let you know what you should be doing. But to sum it up, Helios is to me a goal oriented game. Right from the start you plan what you want to do and stick with it till the game is over. That may be said for other games but Helios is strictly that as a lot of the points come from the characters you buy at the end of each round. But truth be said, its the characters you buy at the end of the FIRST round. That's it. There are only so few characters that if you don't buy what you want early, you won't get it at all. And these characters are crucial to what you do in the game. If you tried to do everything, you will fail and perform badly. These characters streamline your actions and make you focus for points generation. For example, Eric took the character that gave him more points per temple scoring he achieved. So he spent the game scoring temples for his eventual win. My character gave me 5 points per bonus tile I took so I snapped up 4 of them for a breezy 20 points. Though I must admit I bought my character in the 2nd round because I did my usual, when in doubt, let everyone buy something and let the leftover be your destiny. So in the first round everyone bought multiple characters and I bought one of the remaining in the 2nd round. But yes, you see my point? Buy character, work for his goal requirements. Do early = very good, do late = you don't know what to do till you buy someone. My final board. Managed to break 100 on first try, but only good for 2nd place. You get the point. Build buildings = good. And it would be terrible of me if I failed to mention how the actions you get to do are selected. At the start of each round, a face up display of actions are replenished. There are only 3 actions in the game - build, place tile, move the sun. So each player in turn order selects an action tile and executes the action. This means that once a column of action tiles are out, you have no choice but to execute the other remaining action(s). The reason you are drafting tiles though is that each tile has 1 of 4 colors - blue, red, yellow, wild. The colors are important as once you have amassed 4 of 1 color ( wild counts as any ), you will immediately receive a free action of your choice. That is HUGE. Actions in Helios are important and worth all your while. You literally crave for more. Haha. Yeah. So anyway, that was Helios. I thought it was ok. I think it felt very unintuitive to me. None of the actions made any sense. I move the sun to score points and generate resources, ok. I build buildings for effects, ok. I buy a character because I must, without him/her then I shouldn't bother to play the game, ok. It just felt odd, I can't put a finger on it. There's tile placement, building, action selection, abilities, but then after everything it felt like nothing. I didn't feel all that great even when I came in second. When it ended I was still, "what did I just do?". I usually have no problems in themeless games, but this one was so bland and offbase that I had no feeling towards it whatsoever. Like, when I play RR, I don't feel like I am building trains or rails, but at least I can see how it might have fit. Helios however, felt like I walked into a really bad disjointed B grade movie setting and I left more indifferent than I started with. Some ships finally got moving. I thought they would stay there forever. Well, moving on. 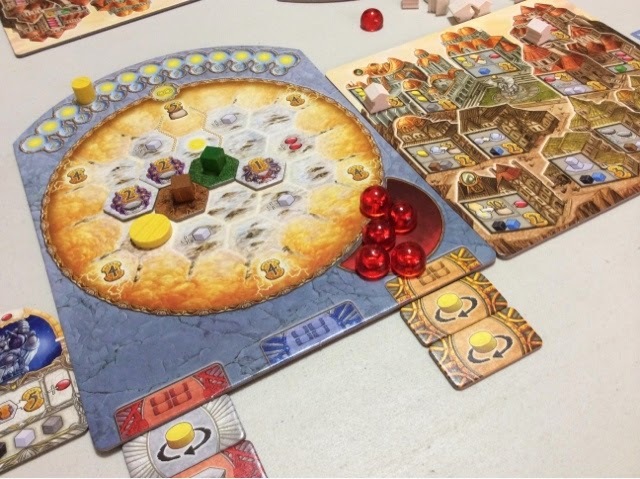 Macao is one Feld game that I have yet to play and when I found that I had the opportunity to play it, I was pretty stoked. I had read about it, read that I needed to do a lot of reading in the game, and because of that I had never personally went out to get the game to try for myself. 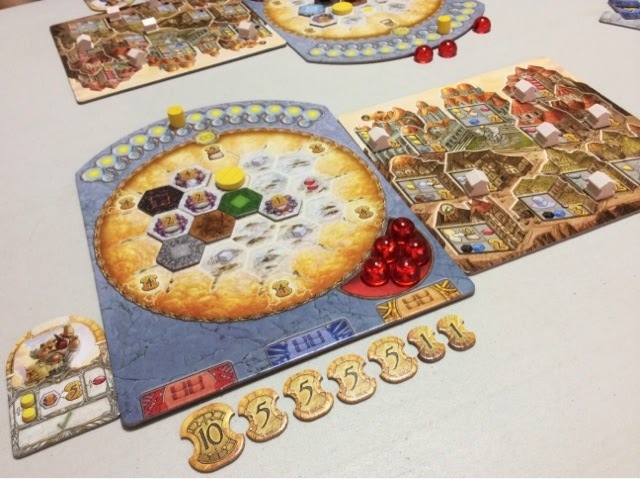 Granted, Bruges has a lot of text to read on cards too, but in Bruges you mainly play with what you have in hand; in Macao you need to read the cards around the board and formulate some form of future plans from there. 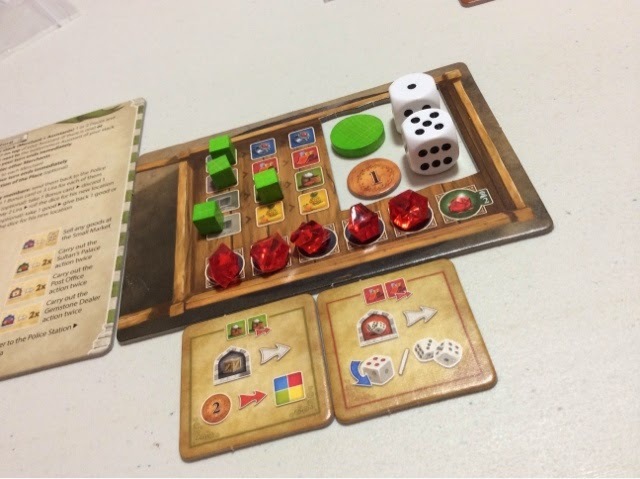 These cubes drive the main economy in the game and each player will always get new cubes each round based on the roll of 5 dice. Once the dice are rolled, players may pick 2 dice to decided how many cubes they get, when they get it, and of what color. This is the tricky and planning portion of the game. So if I picked the purple die that shows number 1, I will receive 1 purple cube this round. If I picked the blue die that shows number 5, I will receive 5 blue cubes 4 rounds from now. This is extremely crucial as all cubes must be used on the round you receive them. So if you wanted to activate a card that requires multiple colored cubes, you need to plan and arrange how you take the cubes through multiple rounds to ensure that when that round appears, they all fall into your action points space. Also, if ever you plan poorly to the point that you have no cubes for a particular round, you will lose prestige points. If you look at my picture below, I have only 1 blue cube / 1 action point for this round. In the next round, if I don't take any dice with the number 1, I will have no action points for the next round and will lose prestige points instead. In 2 rounds time, I am guaranteed 4 red and 3 green cubes, and in 3 rounds time I am guaranteed 6 green and 5 black cubes. This balancing of actions and cubes on your windrose is the whole crux of the game. Do it well and you will see your plans come to fruition. So my engine stalled big time and I was DEAD last. By a mile. Haha. Eric doubled my points and the second place player was like 20-30 points ahead of me. What an embarrassment. I failed at everything. Turn order, area management, resource management. 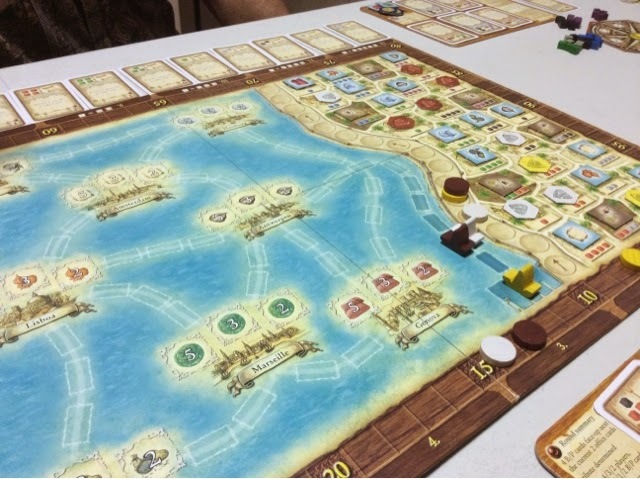 Despite my poor performance, I could see how Macao can be a good game. The managing of the windrose was interesting, the card abilities are nice and varied as well. However it would likely never fall into the top Feld games in my list as his other creations are just so much better compared to Macao. The gathering of cubes based on the dice roll was unique and a very interesting concept, but it just felt too influenced by luck for my liking. 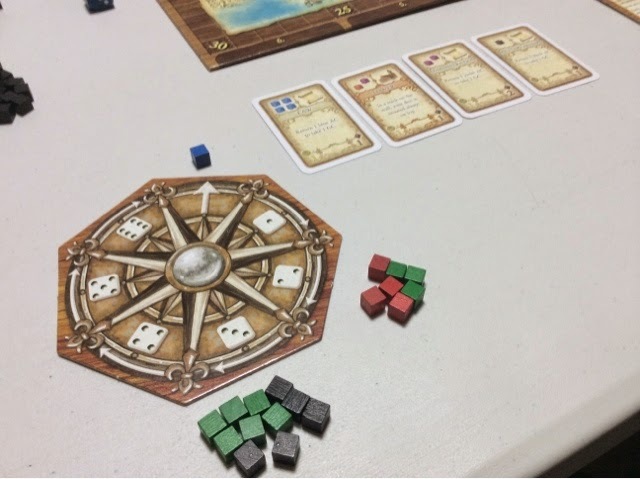 Bruges, Bora Bora, and Castles all have dice rolling, but they are very manageable in their own way ( Castles has workers, Bora Bora has God cards, Bruges dice rolling can be managed by collecting money or repelling the threat ). 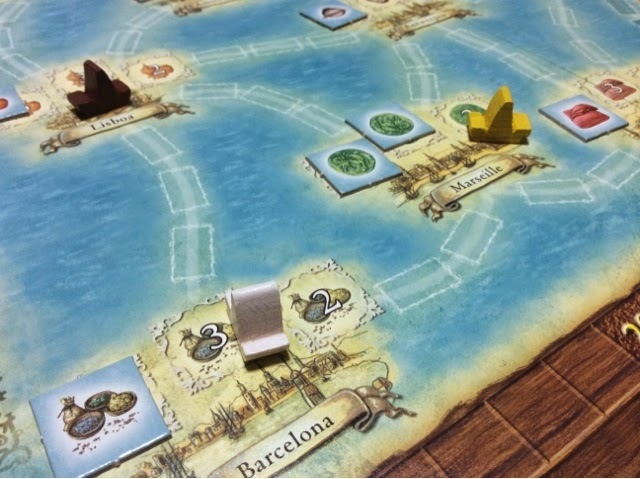 But in Macao, nothing can save you from the mercy of the dice. From all the cards that I saw from our 3 player game, none have the ability to amend or influence the dice rolls. So in the end, even if you tried your hardest to plan to activate say a 4 different colored cube building, there is a genuine possibility that the dice just don't fall your way to ensure that your building will be activated. And that is rather sad as sometimes the activation of a certain card may play a big role in what you had hoped to achieve. That being said, if you can live with the luck of the dice rolls, I think Macao is a pretty decent game. It didn't take as long as I thought it would ( I think we played a 3 player game in about an hour 30 mins ), and the actions available are simple and easy to execute ( all you need are cubes ). There is no fancy unnecessary rule whereby you can only do this if you have this this and this, or you will score vastly more if you had this and this and this. As long as you had the required types of cubes, you may do the action you desire to do. In fact, some actions merely require you to have some cubes of any color, it didn't matter. So you spend the crux of the game managing your windrose and that was really fun. I truly enjoyed that part. I just wish I had more control of the dice so that I can at times guarantee a number and color dice that I want. Would I play this again? Most certainly. But I will take it slightly less seriously than when I started my first game of it. There is still a lot of tactical and strategic moves to make, but I will remember to not over reach thinking that I can force certain moves into place when it may be nigh impossible. I only managed to deliver 3 goods. Very poor. Our very last game for the night was Homesteaders! Our play was fast and the scores were close 48-48-45. I came in last and it was an outright tie for first place ( same number of points and money ). That would have saved me from much debt. The 5 dollars provide no change though, so you have to spend it all. Something for me to remember next time. Painful lesson learnt. 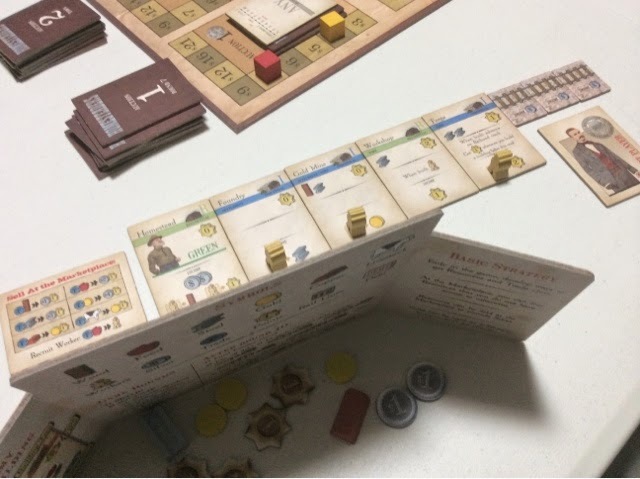 I think the main thing stopping me from taking homesteaders out each time is the length of setup for the game. When we played just the 3 of us, things went quickly as we all knew instinctively to arrange the tiles by type and how to lay out the auction tiles. But if I ever were to take it out at home, I know that I will be the one who has to do everything. Bleh. Wonder if there is an insert to help with that... Heh. My points and gold engine. What I really needed was trade tokens. One magical thing about homesteaders is that it's the only game were I am perfectly fine with taking debt. In other games, I simply refuse to take any debts ( Brass, Wealth of Nations, etc ). But for some unknown strange reason, I just don't mind at all taking debt in homesteaders. Could it be that it is impossible to win without taking debt? Maybe. But I don't know. 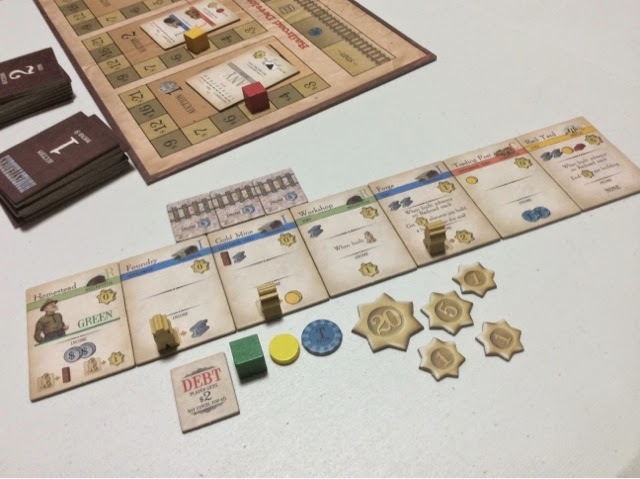 Normal non-debt/loan taking me changes when I sit down for a game of homesteaders. I think homesteaders could really benefit from an expansion, but it doesn't seem like any is appearing soon - at least not in the near future. A nice building shakeup and a mix of auction tiles would be nice. I see avenues to add new game mechanics as well and that would certainly be interesting. So that was possibly my last weekend of gaming at Eric's. It was fun but extremely tiring. I would say that of all the big box games we played, none of them was disappointing. 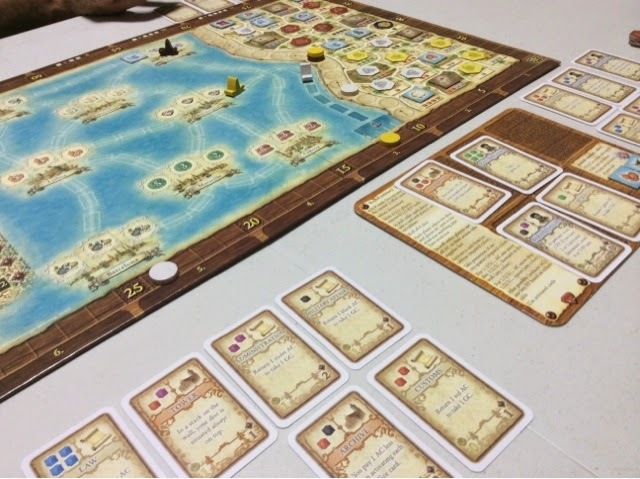 In fact, 2 were good ( Istanbul & Homesteaders ), 1 was pretty nifty ( Macao ), and the last one was decent ( Helios ). If anything, it was merely a disconnect that I felt when playing Helios, but I can see it's draw with it's tight decisions and quick play time. All of them I would definitely not mind playing again and I could see myself eventually getting Istanbul if I need a new game to introduce to my friends.